Summary for the Busy Executive: Good performances of interesting, if not knock-your-socks-off repertoire. The number of Twentieth-Century British composers who keep coming up through the cracks astonishes me. You have, of course, the Mighty Five – Elgar, Vaughan Williams, Walton, Britten, and Tippett – and a very deep bench. You can't really call most of the also-rans the second string, based on quality alone. Not even Elgar wrote a choral work any better than Parry's Blest Pair of Sirens. Robert Simpson and Malcolm Arnold have nothing to apologize for as symphonists. And then you find treasures among the really obscure: Arnold Cooke, Franz Reizenstein, Matyas Seiber, Elizabeth Lutyens, John Hawkins, John Foulds, John Gardner, Richard Arnell, Cecil Armstrong Gibbs, Nicola LeFanu, and even Madeline Dring. The second movement is a Brahmsian allegretto, but without the pastoral qualities of Brahms in that genre. It's uneasy in its tone, and the brief appearance of the pentatonic tune does little to dispel the gloom. 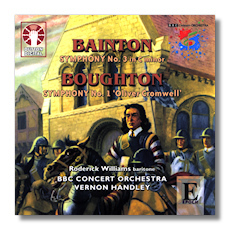 Bainton had written the first two movements and had started the third when his wife died. Too depressed to go on, he laid the work aside for a long time. Eventually, friends and family kept badgering him to finish, and one friend actually announced in a journal that Bainton would have the symphony ready for performance. This got the composer going again. The fourth movement begins pentatonically, with affinities to Bax in the Twenties, and indeed seems to subject earlier ideas to a pentatonic template, as if to calm the emotional disturbances the composer has raised. It certainly solves the problem of what to do after the slow movement. It's no cheat. Bainton has found a musical metaphor for resolution, in the symphony's own terms, no small accomplishment. Fired by Shaw, I sought out The Immortal Hour, Bethlehem, and a bunch of chamber works. Only Bethlehem really stuck with me. Something rather old-fashioned about Boughton's sensibility – a bit like Granville Bantock and the minor writers of the Celtic Twilight – kept me away. Nevertheless, what I think of as Boughton at his most authentic follows in the last movement, a setting of Cromwell's last prayer. In some ways, it suffers from late-Romantic notions of melody – what Vaughan Williams called "village curate improvising" – and it tends to sprawl. Boughton tries to inject structure into it with several fugato passages, but the counterpoint is a bit jejeune. Still, Boughton brings off wonderful passages for the baritone soloist, getting to the meat of Cromwell's words. However, the frame for the baritone strikes me as too conventional and not at all felt. Ironically, the "conventional gentleman" Bainton gives you something stronger than the rebel Boughton. Dutton has produced a wonderful series dedicated to neglected British music – Bowen, Bainton, Arnell, Alan Bush, Cyril Scott, and so on. I also enjoy the cover art, based on British transport posters. All in all, a project that shows a lot of care. Copyright © 2008, Steve Schwartz.